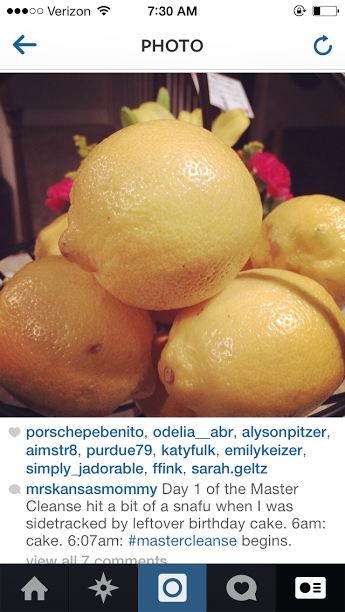 This post was supposed to be titled something much more glamorous like 20lbs in 6 days: The Master Cleanse. 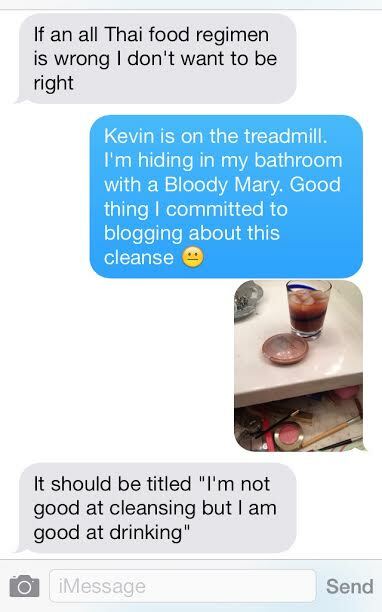 Turns out I hate cleansing. Also, I found out that it would be super irresponsible for me to do that while in charge of two small humans because it made me EXHAUSTED even more than I already am. So why post about this at all? Because I already committed to blogging about it and even though I technically failed at dieting, I still made a couple small changes. And since I’m all about keeping it real here, I wanted to share. I have an unhealthy obsession with reading about different diets on the internet (looking at you, Pinterest) and telling myself that that’s ALL I have to do and I won’t have to think about my weight ever again. Ever notice how diets start with the phrase, “All you have to do…” or “All you eat is…” like it’s the simplest thing in the world. It’s so seductive. Day 1: This was probably my first clue that I should not attempt the Master Cleanse. After the initial cake in the morning, I consumed nothing but the Master Cleanse “lemonade” and then I got super woozy in the afternoon so I ate an avocado. Day 2: Master cleanse lemonade. 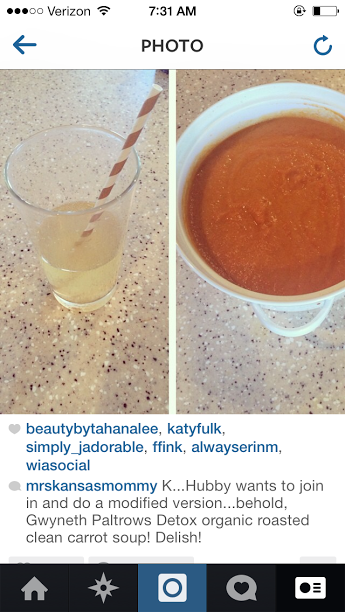 Gwyneth Paltrow’s Carrot Soup. It was really good! Day 3: Master Cleanse lemonade. Carrot Soup. Caprese Salad. 4 slices of pizza for dinner and half a bottle of wine. I’d say that was the night the wheels really fell off. Day 4: Thank God for girlfriends. Bloody Mary. Water with lemon. Carrot Soup. Then I went to a trunk show where I had champagne and some sort of pumpkin cheesecake brownie. Worth it! For dinner I had a couple bites of the kids organic white cheddar mac and cheese and an avocado. Day 5: Despite my indulgence I could definitely tell my tummy was less bloated. Scrambled eggs with cheese for breakfast, 5 chicken nuggets from Chick-Fil-A for lunch, an avocado for a snack and chicken noodle soup for dinner. Also prosecco. Then Avery and I were sitting on the couch and my husband was across the room with a bag of pretzels and somehow a game got started where he was throwing them for us to catch so I ate a bunch of those too. My takeaway is that what works for me as a whole is to generally drink more water, eat more vegetable soup and less meat. Probably good principles for all of us. If you are one of those rare birds that has actually completed, say, a full day of the Master Cleanse I want to hear your experience! Do tell! I tried a cleanse from Whole foods and I actually think it made me gain weight and retain water. I will never do that again. My husband and I are going to Curaçao in March and I want to tone up- the plan is Tracy Anderson DVDs, a few days of Bikram yoga, and reduce the amount of cheese and bread I eat. I want to try Bikram yoga! I’ve heard it feels so good when you’re done. Yes, I definitely will! I think I’ve heard of it before. All good things.